Three major Scottish appeal cases are due to go back to court next week. On Tuesday, a hearing will be held in the case of Luke Mitchell, who was convicted of Jodi Jones' murder. On Wednesday, there will be a hearing connected to the case of William Beggs, who was convicted of the murder of teenager Barry Wallace. The following day, a procedural hearing will be held in the case of Lockerbie bomber Abdelbaset al-Megrahi. The 55-year-old Libyan will not be present. All three hearings will be held at the High Court in Edinburgh. Megrahi claims he was the victim of a miscarriage of justice. His hearing will be chaired by the Lord Justice General, The Rt Hon Lord Hamilton, who will sit with Lord Kingarth and Lord Eassie. The full appeal - before a panel of five judges - is likely to be heard next year. Mitchell's appeal against his conviction and sentence, is based on his legal team's claims that he did not receive a fair trial and a miscarriage of justice had occurred. Luke Mitchell, now 18, was found guilty of killing 14-year-old Jodi Jones in Dalkeith, Midlothian, in 2003. 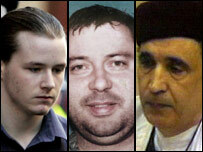 Beggs was found guilty in 2001 of murdering Mr Wallace in Kilmarnock. He was jailed for life and ordered to serve at least 20 years in prison. He is appealing against his conviction. Both Mitchell and Beggs are expected to attend court.